London based hip hop artist Grit Grammar has recently had their forthcoming single ‘Hard Times’ championed by BBC Radio 1 Xtra and have been selected as the 100% Homegrown unsigned track of the week by DJ Target. ‘Hard Times’ featuring Genesis Elijah (produced by Baron Samedi) is taken from the upcoming album release ‘Life Music’ which was recently mastered at Blue Pro Mastering. Grit Grammar is a London based hip-hop artist, who has been performing and developing his craft for years, whilst releasing music under his own fully funded label BTS Recordings. Grit has developed a unique image and identity away for the stereotypes of the genre, and has focused on creating accessible music that draws deeply from his personal life, complimented by carefully selected, forward moving soundscapes. His first promotional street album ‘Reflections in the Dark’ from 2008 received wide spread acclaim and radio support, and was a major step elevating Grit to the position of one of the elite in a new generation of rising UK based hip-hop artists. 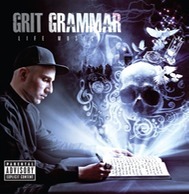 Grit has worked and recorded with some of the most respected and well known rappers in the UK including Kyza, Verb-T, Genesis Elijah, as well as International independent rap heavyweights ILL BILL, and Mr Sche who has produced for and worked with such platinum selling artists as T.I, Trey Songz & Black Eyed Peas. Grit has greatly increased his overall exposure in the last couple of years featuring on a number of high profile mix-tapes and albums including Grind Time UK hosted by Dj Drama, and ‘Verbal Scriptures’ which was nationally distributed. Grit has also had the opportunity to perform all over the UK, including the Rising Styles and Eastern Haze Festivals culminating in his biggest show to date opening up for the multi platinum US mega-star Flo-rida at the 4000 capacity O2 Indigo Arena in London.